← The summer of disruption starts here: Jupiter and Uranus team up! 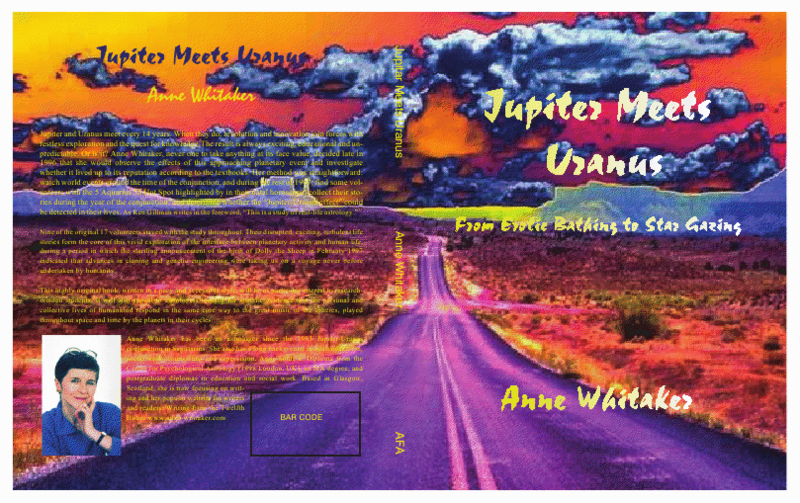 Jupiter/Uranus in Aries June 2010: the wild ride begins! Astrological knowledge is indeed double-edged: I have discussed this duality in previous articles, which have generated considerable interest and provided me with a new ‘generation’ of 2010/11 Jupiter/Uranus researchees, following on my study of the lives of 17 subjects during the 1997 Jupiter/Uranus conjunction in Aquarius. But I feel it is more helpful than otherwise to have some advance warning of our movement into, and through, a tempestuous energy field which promises disruption collectively and individually – but also open us up to possibilities for growth as yet unknown….we need to be humble in the face of these great forces, recognising that there is only so much we can do to prepare for them. So – watch your anger levels, try not to take it out on those around you (also my advice to myself! ), realise that certain circumstances are going to arise which will be outwith your control. Adapt – fast. Get used to feeling dazed and somewhat shocked. Try to free yourself from bonds you know are destructive – if you don’t, life is liable to provide that impetus from the left field…. This entry was posted in Astrology Article Archive 2 - Jupiter Meets Uranus 2010/11 and tagged "Back to the Future", “Jupiter Meets Uranus”, Icelandic volcano eruption April 2010, Jupiter Uranus conjunction 1997, Jupiter/Uranus conjunction 2010/11, Jupiter/Uranus in Aries, Jupiter/Uranus in Aries and Pisces 2010/11, Large Hadron Collider, The fourteen-year cycle of Jupiter and Uranus, Uranus moves into Aries on 28th May 2010.. Bookmark the permalink. I have a Mid Heaven of 3 Aries, so I am nervously eyeing the conjunction. I have no fire in my chart to get me through with confidence. However, when Uranus went over my Mars in Aquarius I moved in with my husband. I had dreaded that transit for years. We had been unable to find a place in which to cohabit before that time. I didn’t hurt myself. It was a lot of work moving the Cancerian accumulations. I got rid of immense amounts of stuff. Perhaps my dreadful antibiotgic will have great results and I will become a flaming Lyme Disease activist. Ojalá! Would be nice. Not that nice is a word to connect with all this. (Aries) or hiding in our ocean caves with plentiful supplies of intoxicants(Pisces)! Keep us posted…. As a sceptic ( in the open-minded sense of the word!) it seems to me that the human tendency to predict the end of the world is archetypal, and has been going on for millennia – despite which we are still here! 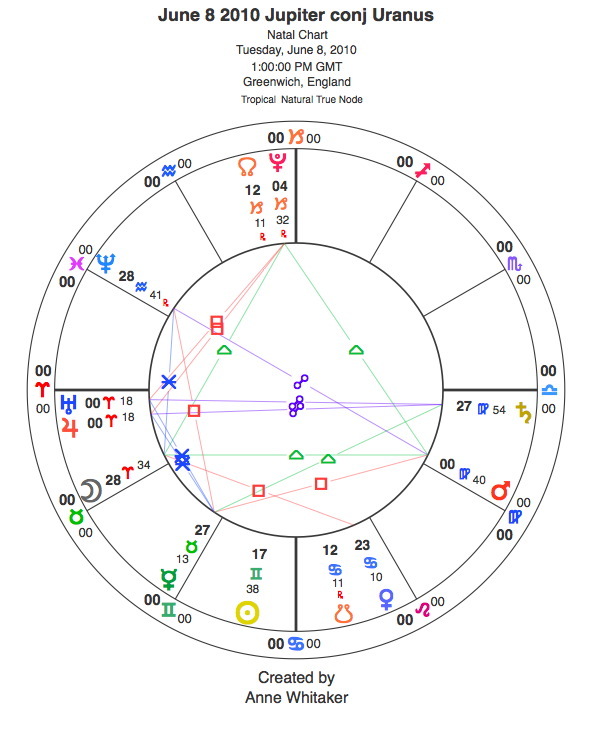 Having reached the grand age of 55, I am not so excited by the coming jupiter/uranus conjunction as at the same time, I still have Pluto squaring my sun and just about squaring my moon also early Aries (!!) and Saturn sitting in opposition to them… 1969, my father died abruptly / unexpectedly, 1983 saw the start of several years of recovery from deep depression, 1997 I became homeless with my young daughter for 3 months at the heart of the winter… and so… 2007 redundancy and despite grafting through in that decade which saw me achieve a Doctorate (against the odds) start work as a researcher, lose my job, find another, lose it again… this time, I am not been able despite continuous dedicated efforts to return to work… poverty trap has now come to sit on my door step…. I am holding out… hoping but getting very drained mentally, emotionally and physically…. I am free-spirited and positive… a good Aries ..my natal chart set just after a new moon, arbor the pattern of a cross: Venus (in Aquarius) opposite Pluto (leo) squaring Saturn (scorpio) opposite Mars (Taurus). Life has been a continuous determine effort to overcome the limitations and hurdle facing me. In a sense, I feel I have achieved a great deal, in others, I am still at ground zero: Difference? This time, for the first time, I have NO idea in what direction to go. Blank slate.. I am here and now. I, who always worked out a plan, have none. I cannot think anymore, I am emptied. I just know that I need to work to survive. All the rest .. luxury. Thank you Ann. I followed the URL and read… let me update you on 28 May, 3pm UK time – my date of birth is 24/03/1955 in France… and the surprise of my reply is that it will connect to the start of the processing of the data from the Large Hadron Collider in some ‘quirk of destiny or fate’…. at least at a conjecture. And here is what happened to me on May 28, 2010.
this is fantastic feedback – both from a research point of view, and also for a strong indication of what hopefully may be a turnaround in your personal circumstances. If you want to join our research, do let me know your birth time and place,(it’s on your Birth Cert in France) and email address – info@anne-whitaker.com will find me. Best wishes for interview 2! Well, I’m seeing the effects of the transits all around me, but not so much in my personal life…yet. Perhaps this will come at the time of the lunar eclipse or Mars in Libra. I have put serious effort into maintaining my composure and trying to think carefully before I act (or speak, lol), so as not to unleash that disruptive energy directly into my personal sphere. My life is going well, I am employed in a job I love, I am grateful for everything I have but I don’t believe I am overly attached to any one thing…(I have concerns about being overly attached and having it “ripped” away from me.) I am very analytical and do my best to circumvent the potential before it hits me over the head, so to speak. I have begun to study mundane astrology a bit more than usual; however, I think that may simply be because of the multitude of transits that are forthcoming. Anyway, I will stay in contact and keep you posted when I have that “big bang”! Just wanted to mention one more thing…I know this isn’t related to the Jupiter/Uranus conjunction but astrology is a study of all transits, so thought this might be helpful to someone. Saturn entering Libra (back and forth since fall 2009) I notice I am unusually tired…exhausted actually. It is in close orb, conjuncting my sun and ascendant. I think I could literally sleep 15 hours a day and still wake up tired. But on a positive note, I have been able to accomplish a great deal at work…keeping current on a caseload that other employees find impossible. This has given me great satisfaction and places me in a valuable position with my agency. (I’m a Child Protective Services Investigator with a Social Services Agency). Just food for thought. Here is the latest post on my ‘Jupiter meets Uranus’ site which amongst current affairs commentary, pays tribute to my band of researchees. Thanks again for joining! Fighting with disappearing posts again, so if this is a duplicate, please forgive me! Just read that Jupiter was hit by a comet or asteroid and the impact was caught on film…interesting considering the timing! I think Jupiter/Uranus triggering both our charts has made you able to read my mind! I have been thinking of starting a research file for collecting collective and cosmic events during the observational year of March 10 – Feb 11 which resonate with the Jupiter/Uranus energy field, and which are ‘picked up’ both by members of the research team and by interested supporters of the research project in general – and here you are, contributing to it before I even ask…. thanks for this interesting item which I will use as the start of the file. It’s great to have this help. , and hope that other readers will pick up on our exchange and send in links from time to time.